Specialist divers who last night entered a flooded mine in a bid to free four trapped miners have been forced to return above ground. 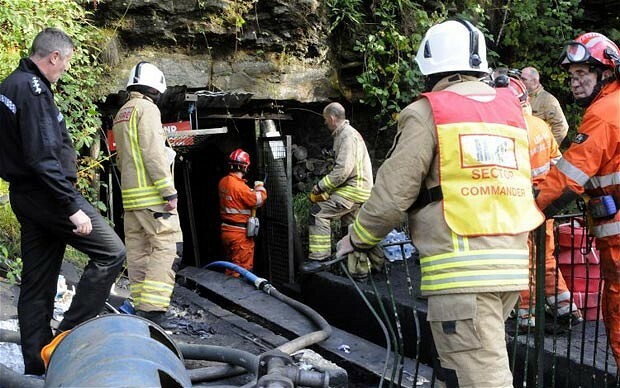 Rescuers went into the Gleision Colliery near Cilybebyll, Pontardawe in the Swansea Valley, where the men have been trapped 90m below ground since yesterday morning, but had to abandon their efforts after about 30 metres. There has not yet been any contact with the miners, named by South Wales Police as Phillip Hill, 45, the mine owner from Neath, Charles Bresnan, 62, David Powell, 50, and Garry Jenkins, 39, all from the Swansea Valley. Gary Evans of the South and Mid Wales Cave Rescue Team said: “We brought in some divers to see whether it was possible to go through and speed things up. They had hoped the divers could assess the situation before all the water had been pumped out, but debris had made the water murky, Mr Evans explained. He confirmed that despite the lack of contact with the men, they remained “very hopeful”. It is believed the miners would have fled to an air pocket to await rescue. Police said emergency services were continuing a “multi-agency rescue operation”, while the men’s families were being supported by family liaison officers. Fresh rescue teams were brought in this morning to relieve crews which had worked strenuously for at least 12 hours straight. An expert listening device, which can detect movement deep underground, is among the specialist equipment that has been drafted in as part of the efforts. A fifth miner was last night critically ill in hospital after escaping as flood water engulfed the drift mine. Two other men who were with him escaped largely unharmed and are aiding the rescue operation. The alarm was raised at the pit at around 9.20am yesterday. A retaining wall holding back a body of water underground failed, flooding a tunnel that the seven miners were in. Chris Margetts, from South Wales Fire and Rescue Service, said: “What we have determined is the miners are located approximately 90 metres underground. “They are down a 250 metre main route into the mine. There are numerous little tunnels and old workings which all potentially have air pockets in. He said they were pumping it out and, once they were in a position to search off the main shaft, they would then systematically look through the smaller tunnels and shafts. He added that rescuers were very “hopeful and optimistic” that the miners could be freed successfully. He said they were constantly monitoring the quality of the air, but could not communicate with the trapped men. An emergency centre has been set up within the community hall in the nearby village of Rhos to cater for the families of the miners. The Red Cross delivered a haul of blankets and pillows to the centre last night. Neath MP and former Labour cabinet minister Peter Hain said he had spoken with family members, many of whom were in tears. He said he had been assured that everything possible was being done to free the trapped men and vowed resources needed would be brought in to help the rescue efforts. “Nothing is more important than the lives of these men,” he said. He added that he had been given regular updates on the situation himself by the on-scene police commander and rescue crews. “They tried initially to get into the tunnel that the men use to go in and out of the mine but it was blocked with water,” he said. Parish priest Martin Perry hailed the spirit of the community and said there was a “real sense of hope” that the miners could be rescued. Prime Minister David Cameron said: “My thoughts are with those missing and their family and friends at this very difficult time. Labour leader Ed Miliband said: “This will be a terrible time of anxiety for their families. “I know the emergency services are doing everything they can. The community where the rescue is being carried out was already reeling after the tragic death of Harry Patterson on Tuesday. The five-year-old, who lived within walking distance of Cilybebyll in the nearby village of Alltwen, died after apparently releasing the handbrake on the family’s Seat car, which was parked in the driveway of his home. Gwenda Thomas, Labour AM for Neath, spoke of the double tragedy which has hit the small community. “All those living in the villages are part of the same community and the terrible accident on Tuesday with the little boy and this today will be deeply felt,” she said.